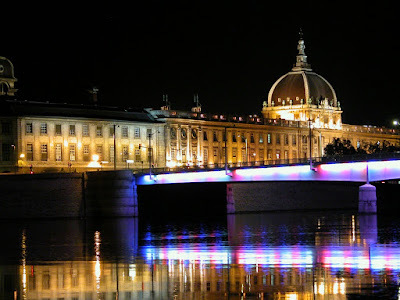 On the Eastern bank of the Saone river, you find Hôtel-Dieu, serving as a hospital for the citizen of Lyon for 800 years. Here are details from its history. 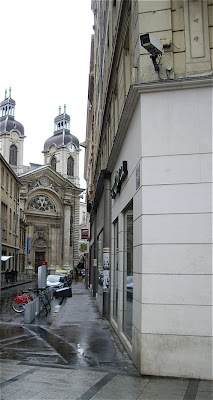 A religious brotherhood founded a hospice in the Guillotièr quarter of Lyon in 1184. The brotherhood had stayed and worked in this area since the 10th century and had built the first bridges over the river. In 1454 Maïtre Martin Conras, the first professionally trained doctor, was appointed to serve at Hôtel-Dieu. Another and more famous character arrived to serve as a doctor in 1532. François Rabelais trained as a doctor at the universities of Poitiers and Montpellier and arrived this year to work as a doctor at the hospital. He left his post in 1535, possible due to the suspicion that he was involved in "l'affair de Placard", the spread of posters of anti-catholic character attacking the King and the French establishment. The hospital has been continually extended during the centuries. In 1622 existing buildings were torn down, and a new cross-shaped complex was constructed. A new church was cobstructed in the late 1630's based on designs of Ducellet, under the supervision of Cardinal Richelieu. The architect Jacques-Germain Soufflot (1713-1780) made the plans for the largest building works at Hôtel-Dieu, and a "large tempel" was constructed with a magnificent facade along the river bank from 1741 to 1761. The main entrance is flanked by staues of King Childebert I and his wife queen Ultrugothe, that were said to have founded the first hospital here in the year 549. The large dome was finished in 1755. 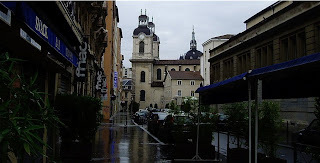 It was severely damaged by the bombing of Lyon during the Second World War. 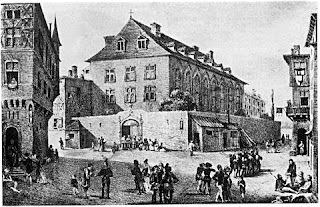 As for many old building, the French revolution was a disaster for Hôtel-Dieu. During the siege from August to October 1793, much of the buildings were destroyed. Many of the professionals were executed. The hospital was rebuilt in the 19th century and was the scene of several breakthroughs in the treatments of cancer during the late 19th and early 20th century. The first X-ray was performed here by Étienne Destot in 1896. An important radiological treatment centre for cancer was founded at Hôtel-Dieu in 1923. The buildings still belongs to the University Hospital of Lyon but their history as hospital will come to an end in 2010 after 826 years (at least). A museum to celebrate its rich contribution to the progress of treatment are planned on the site.